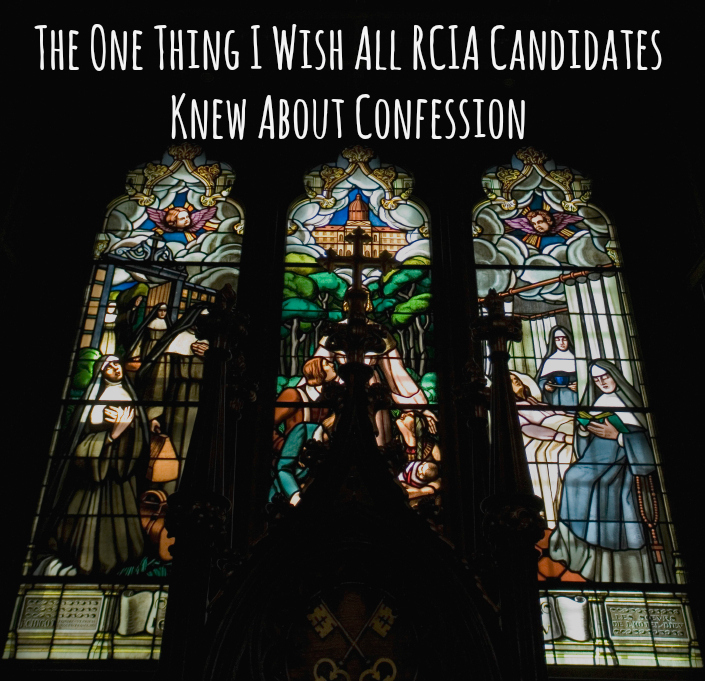 Confession is a scary word to most Catholic RCIA candidates. It looms in the distance as the big hurdle you must cross before joining the Church. Truth be told, I was more nervous about this sacrament than any other part of joining the Church. I was sweaty, nauseous and nervous as all get out. I suspect I’m not alone in my trepidation. It’s not that I didn’t welcome confession/reconciliation — I thought it was a wonderful opportunity — it was just the “doing” it that had me shaking! But, Catholic newbies and RCIA candidates, I want you to know something about confession that you won’t understand until you experience it several times. Reconciliation is about forgiveness but it’s about a LOT more, too. After I went to confession a time or two, I noticed that not only did I feel relief at being forgiven, but it seemed the very things I was struggling with sometimes just completely went away! So, for example, if it was custody of the tongue that was an issue, suddenly the temptation to say what I shouldn’t just up and vanished or I gained an improved ability to control it. I didn’t know quite how to explain or put into words exactly what was going on, but I new that confession brought me a benefit beyond forgiveness. In reading Vinny Flynn’s “7 Secrets of Confession” recently (a great book for newbies, by the way, to help you fully understand the sacrament), I realized what I was experiencing. It was “healing”! He beautifully puts into words the amazing power of the sacrament of Reconciliation. It IS forgiveness, but Christ already “took away” our sins when He died on the Cross. We are reaching into time and accepting that “taking away” that he has already given for all sins that have been or will be committed. But because the priest acts AS Christ, we also encounter Jesus here just as we do in the Eucharist in the form of bread. It’s one of TWO opportunities to encounter the living Christ. And when we meet him with true repentance he heals us. So that’s what I want you newbies to know — it’s also about HEALING. When you go to that first confession, yes, you can unload all of the things you’re sorry for and breathe a big sigh or relief that you’ve been forgiven. But expect MORE! You will be healed, too, and our Lord will help you overcome your temptations going forward. So don’t go just one time to complete this step on the road to becoming Catholic. Make it a habit to go at least monthly. Why would you want to pass up the opportunity to meet Jesus and gain strength in overcoming temptation? Newbies, I want to hear your worries and anxieties or excitement as you get ready to experience this sacrament! I’m happy to help answer any questions you have as someone who did this just one year ago. Experienced Catholics, please share this post with any RCIA candidates you know and lets show them the power of Reconciliation! I went through the exact same thing a few years back when I entered the Catholic Church=you would think I was a lamb being led to slaughter! Then I wondered what all the fuss was about. I was grateful to let go of a sin that had been on my mind for years=I was secure in the Lord`s forgiveness. Thanks, Lyn, for making such an inspirational case for Confession. For many years (after a long, long time away) I made a commitment to go once a month. Recently, I’ve been going weekly (I heard Mother Teresa and Pope JP among others I admire did that.) Going to Confession really keeps me on tract. I know if fills me with graces, so that must be what is lifting me higher these days. Thanks Patti. I have been bad this winter about going – I always seem to have an excuse. I did much better spring, summer and fall. I’m sure you’re in great spiritual shape if you go weekly :). I’d like to try to get back to monthly and then go from there. I have been a catholic since birth, and I can tell you the feeling of anxiety, nervousness, embarrassment as you wait outside never goes away. Neither does the feeling of bliss and inundation of God’s graces after you have been absolved. The sacrament of reconciliation is an amazing thing! I am coming into the church on Easter vigil this year, so just a couple weeks! I am going to confession tomorrow and I am feeling all kinds of anxiety, fear and embarrassment. I am ready to go and get my sins wiped away and receive healing, but boy! am I dreading it for right now.. :/ Pray for me! Congratulations! I hope you got through your nerves and experienced the wonderful grace of Reconciliation! Please do share how you feel afterward to help others who felt just as we both did :). Definitely praying for you as you approach Easter! Whoo hoo! Me too!! 🙂 So glad you have found it as wonderful as I have. Keep going monthly and keep the graces flowing … Welcome to the Church! Thanks for your comment and congrats on joining the Church! I felt the same way — I was ready long before it was time to actually do it, but the waiting is kind of good. It makes it a prized possession worth waiting for. Let me know if I can help answer any questions of things you are nervous about. Happy to help! I’m still a bit daunted by the idea of confessing all my sins since I was Baptized in 1974. Gee, that’s 40+ years of muck in my life. I’m sure I can hit the “highlights” but other than that, I can’t remember. At least I can remember getting baptized. My best memories (or worst as the case may be) are in the last 20-25 years. What do you do? Make a list? I am currently going through RCIA and have been searching for an answer to an apparently very difficult question regarding confession. I am a Christian and have many times over the years held a sort of confession between just myself and God. I’m a very conscientious person and will open my heart to Him and admit any wrongdoing. I’ve spent many a night confessing and crying. My question is this: Scripture tells us, “If we confess our sins, He is faithful and righteous to forgive us our sins and to cleanse us from all unrighteousness.” (1 John 1:9) I can’t remember the exact passages, but in other places it talks about our sins being forgotten by God once confessed and forgiven and that we should not dwell on them. So, when I go to my first confession, am I supposed to confess things from my past that I believe have already been forgiven and absolved? It’s not that I’m too ashamed to say them, I just believe that they’ve already been dealt with. I understand the purpose of Confession but I don’t feel like the sins I’ve openly and wholeheartedly confessed to God over the past 25 years are still hanging over my head because I didn’t say them to a priest. Now, I still have plenty of other things I’m dealing with and by the time my first confession rolls around, I’m sure I’ll have plenty more to confess. But even though I wasn’t Catholic, I basically did everything a Catholic would; including doing penance sometimes. Just because no one else was around to hear, doesn’t mean I didn’t take it VERY seriously. I knew that God had seen and heard it all and the guilt and shame were immense. I felt the weight lifted off of my shoulders after true repentance. So, what am I to do? This question has been hanging over my head for quite awhile and I was wondering if you’ve come across anything that deals with this subject directly. Hi Jess, thanks so much for your comment and question. Catholic confession does require you to confess all the sins of your life (that you can remember :)) to a priest. While it’s a wonderful thing to confess your sins directly to God and you should definitely do so, Catholics believe that you must confess your sins to another person, specifically a priest in whom Jesus is present. In John 20: 21-23 Jesus instructs his apostles to forgive sins. So, why would he do so, if sins did not need to be forgiven in person? 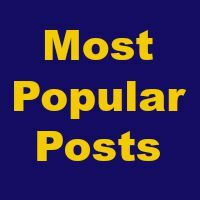 Here is a really good article on the topic: http://www.catholic.com/blog/tim-staples/is-confession-in-scripture-0. I would highly recommend you raise this question in your RCIA class or privately with one of your instructors to hear their explanation as well. Also, if the list is too overwhelming to confess all at once, you might ask if you could break it into a couple of sessions. Though priests hearing first confessions expect it to take a while :). Good luck and let me know if I can answer anything else! This is my first year preparing candidates to enter the Church, and I have one woman who is very anxious about having her first Confession heard. I’m a cradle Catholic, so I don’t know what its like doing this as an adult. If anyone has suggestions on the process that worked for you, please share. She is working steadily on her examination of conscience, but this is now a matter of “nuts and bolts.” Thank you, and God bless you! I like Fr. Mike Schmitz’s YouTube videos. He has one about confession. He talks about it from the priest’s perspective. it’s a relief to know they really don’t remember what you say. He is there in place of Jesus so it might help to think about it like that. Matthew Kelly also explained it very well. He said it’s like getting your dirty old car detailed. When it looks so nice and clean you think twice about junking it up again. So confession helps us avoid sin because we don’t want to return to the way we were before. Pretty amazing! 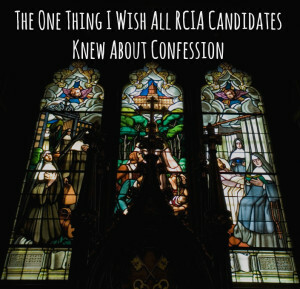 Can I go for confession while attending my RCIA classes? That’s a great question and congrats on going through RCIA! So you should wait until your RCIA leader tells you when you’ll be going to Confession. It is usually a scheduled part of the process. And I believe those who are going to be baptized at the Easter Vigil Mass do not need to go to Confession before then as you are cleansed from all your sins when you are baptized. I think your best course of action is to check with your RCIA director. Thanks for the question!